When Canada’s second-largest bank set about becoming a “bank of the future,” it began to integrate innovative thinking across its entire operation. 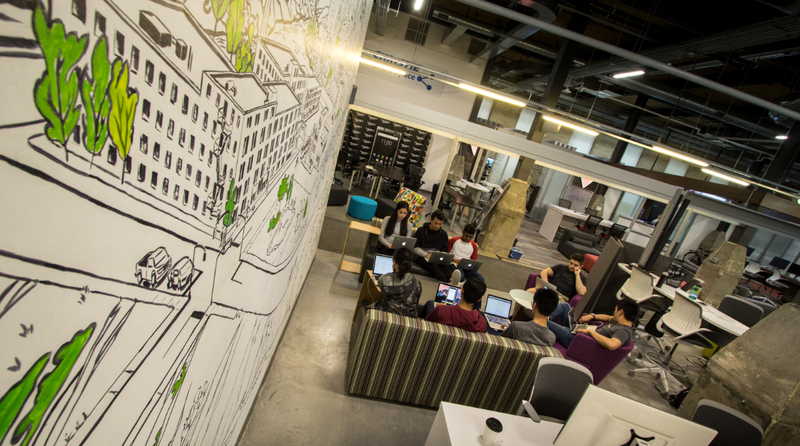 In 2014, when TD Bank Group launched the TD Lab at Communitech, Waterloo became a vital part of that transformation. Four years later the concept of a “corporate innovation lab” is well-regarded and TD – an experienced player in this space – has learned some things about the power of harnessing technological disruption to meet the evolving needs of their consumers. Developing new products and new ways of thinking depends on business practices and environment. That’s why the decision to join Waterloo’s renowned collaborative ecosystem was an important first step for TD Lab. 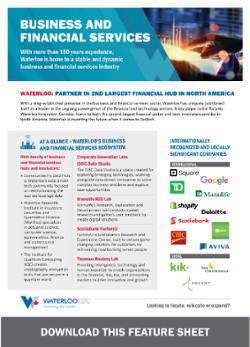 With the world’s highest density of corporate innovation labs, the highest density of startups outside of Silicon Valley and a vast peer-to-peer network, Waterloo makes collaboration easier than anywhere else. Part of the attraction of founding an innovation lab is the opportunity to try new ideas in a low-risk environment. In less than four years, TD Lab produced more than 200 prototypes, including augmented reality banking experience, banking literacy application for children, and more. This lab is now a strong model for driving innovation in large corporations. Coming up with new ideas requires fresh perspectives, which is why Waterloo’s unique talent pipeline was integral to TD Lab’s success. Each school semester, TD Lab employs a dozen co-operative education students from local post-secondary institutions. “These students come from different disciplines like engineering or business, and we’ll pair them up with a professional engineer or architect or analyst and they’ll work on different problems together,” says Hogarth. These students come from the University of Waterloo, home to the world’s largest co-operative education program, Wilfrid Laurier University, home to Canada’s largest business co-operative education program, and Conestoga College, one of Ontario’s top polytechnic institutes. Altogether, Waterloo institutions have more than 20,000 students in these programs at any one time, and most graduate with more than two years of on-the-job experience. Want the full story? 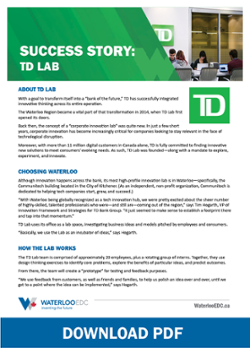 Click here to download our TD Lab success story for more detail about their innovation lab. Waterloo has the capacity to make innovation hubs of all types and sizes work. If you’re interested in manufacturing innovation, incorporating new approaches to technology or simply tapping into our unique research environment, Waterloo EDC can help make the connections that will help you take the next step. Contact Catharine Gerhard today for more information.